Earning an above-average wage early in a career is a critical predictor of long term success. Raises and promotions compound over the course of several decades. This means that if young people start out earning relatively little compared to their peers, they tend to make less over their lifetimes. Our new map highlights the parts of the country where millennials are earning the most (and least) on an adjusted basis. We pulled our numbers from the U.S. Census Bureau, which tracked the median amount each age cohort made in 2016, the latest year in which comprehensive data was available. The Census Bureau defines “millennials” as people born between 1982 and 2000. Another factor that influenced the data is the cost of living differences across the country. Knowing those differences, it’s clearly not surprising that people in Massachusetts earn more than those in Alabama. To account for that, we adjusted the figures to reflect the true cost of living in each region according to the Bureau of Economic Analysis. This creates a level playing field to compare income levels in different states. Our next step was to simply create a heat map of the country, showing which states have the highest (purple) and the lowest (light blue) median wages for millennials. Millennials are an interesting group to study for a couple of different reasons. They are the most diverse generation in American history, more of them went to college than previous generations, and they are now the largest contingent in the workforce. Many of them also graduated in the middle of the Great Recession, which economists believe might have a lifelong impact on their wages. Determining where millennials are doing well (and where they are not) indicates broader trends in the American economy. 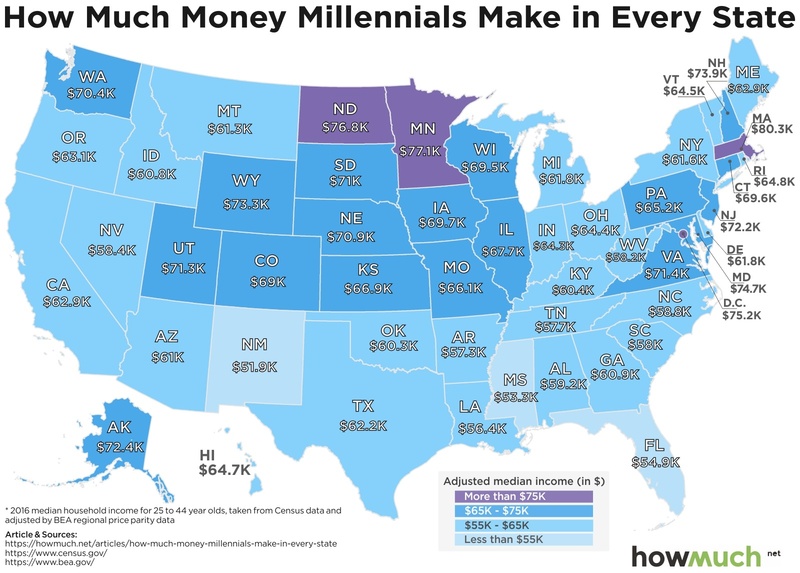 For example, there’s a pocket of purple and dark blue states in the Upper Midwest where these younger adults tend to make above-average wages, as high as $77,090, on an adjusted scale, in Minnesota. The same can be said about the Northeast between Virginia and New Hampshire. These regions contrast with the South, where Texas is the highest state at $62.2K, coming in at number 32 in our list overall. The South clearly stands out as a lackluster region for millennials in the labor market. Perhaps the biggest surprise on our map is the West Coast, which doesn’t look that different from the South. The one exception is Washington ($70.4K), which is $7,000 higher than California ($62.9K). This highlights the fact that big tech companies are creating great jobs for a select group of skilled workers, but if making the most money is your primary goal, you have a better chance of succeeding if you move to Nebraska instead of California. Want to learn more about where the highest-paying jobs are located? Check out our map of companies that pay the most in every state.